Mention of the town Mystic, Connecticut, established in 1654, summons thoughts of two things: the historic seaport and pizza. OK, yes, Mystic Seaport: The Museum of America and the Sea, to quote its full name, is a huge attraction and educational program that brings many visitors to the Connecticut coastal town. And, of course, movie buffs, Julia Roberts’s fans and lovers of big hair know the hamlet for the 1980s movie, Mystic Pizza, which revolves around the town’s still standing pizza joint. But neither cultural reference point is the be-all and end-all; Mystic is a relaxing yet relevant destination for dining, drinks, nature and even art. And, yes, if you fancy some pizza, Mystic Pizza lives up to the hype. You will need breakfast, so you might as well eat like a local at this adorable waterside diner. Choose an indoor table or one on the outdoor patio deck right by the Mystic River Marina, which has dreamy views of the Mystic Harbor. Boaters can dock for up to three hours while noshing. Kitchen Little is just a few miles from downtown Mystic on Mason’s Island. There’s an all-day All-American breakfast with options like the Portuguese fisherman’s omelet, celebrating the area’s Portuguese immigrants who flocked to the area to work in the flourishing whaling industry in the 1800s, and there are scallops pulled from the water at nearby Stonington, as well as other locally caught seafood. The Mashantucket Pequot Tribal Nation runs this unique museum dedicated to Connecticut’s indigenous history and culture. It’s a nonprofit educational facility that gives voice and visibility to America’s first inhabitants: Native Americans. The main exhibit looks at pre Colonial, pre Connecticut life and the violent devastation wrought by English and Dutch merchants on the Pequot tribe, including such genocidal raids as the Mystic Massacre in 1637. It’s a violent, tragic story, but the museum also highlights cultural aspects and includes rotating exhibits. The Inn at Mystic is set on a former private estate and its Harbour House restaurant has a waterfront terrace, but for colder months there’s cozy fireside dining indoors. In New England, a home or hostelry’s heart was in its fireplace and it’s a tradition that remains. The Harbour House—note English spelling, nodding to the area’s past—menu favors seasonal and local produce, as well as traditional seafood staples we know and love, and have come to expect from New England. Dive in head first with the seafood tower of oysters, clams, shrimp and a whole lobster. Just a short walk from Mystic’s Main Street, the newly opened Spicer Mansion is truly a boutique experience: it only has eight rooms, and the ninth, Room No. 9, is a speakeasy styled bar accessed behind a bookcase. Set on a five-acre estate with carefully curated gardens, Spicer Mansion was originally built in 1853 as renowned sea captain Elihu Spicer Jr.’s summer home. Exclusivity is a continuing theme: Spicer Mansion’s restaurant has a no walk-ins, reservation only policy. Relax in Room No. 9’s classy lounge atmosphere where you can nosh on pates, cheeses and charcuterie and sip a sublime cocktail. For stogie lovers, there’s a cigar lounge as well. There’s a river, might as well cruise it. Located on Washington Street in the Seaport Marina, Mystic River Cruise offers a personal cruise up this waterway on small boats carrying a maximum of six passengers, ensuring you’re not stuck on a boat with crowds of drunk dancing tourists with no escape. 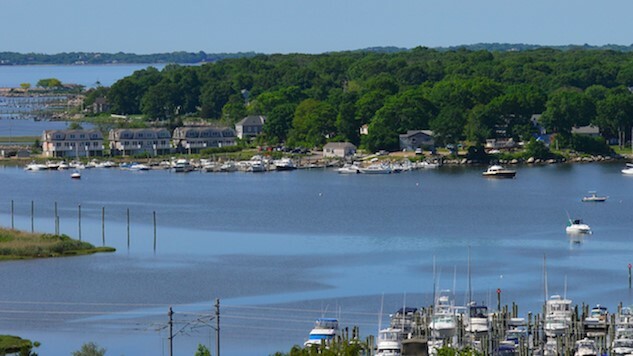 There are breakfast and lunch cruises, with a bakery style breakfast or a picnic style lunch from one of Mystic’s local bakeries or restaurants. There is also a sunset cruise with coffee, tea and hot cider (spike it you like, but you’ll have to bring your own toddy makings as the cruise is BYOB). Yes, Mystic has an art museum and, comparative diminutive size notwithstanding, it’s home to a fine collection, as well as rotating exhibits. The museum grew out of an artist’s colony that sprang up in the area when landscape painter Charles Harold Davis settled in Mystic in 1891 after returning from France. Taking their art into their own hands punk rock style, the artists founded the Mystic Art Association in 1913, and then built and opened the Water Street Art Gallery in 1931. In 1979, the Mystic Art Association evolved into a nonprofit, non-stock corporation, keeping its independent streak alive. In 2004, it became the Mystic Arts Center (MAC) and the Mystic Museum of Art. But basically, we recommend this beautiful collection because it beats tromping around yet another sad aquarium. If you’d rather soak in some local shipbuilding history while sinking a cold one, The Irons restaurant and bar is the place. Tucked inside the totally renovated Hilton Mystic, located in the heart of the town, The Irons is named for Mystic’s historic Irons and Grinnell Shipbuilders, and you can bet they ran with the nautical theme: reclaimed shiplap, brick, iron and canvas are design elements. The menu is solid, with casual favorites from fish and chips to a Portobello veggie sandwich to steak frites, and the open-air courtyard with gas-flamed fire pits and sofa seating is the place for drinks and bites early evening till late. This is the place everyone in the area flocks to for that great New England summer combo: fried clams and ice cream. Sea Swirl, a tiny roadside seasonal seafood shack, is famous for juicy fried clams, whole bellied or strips, but they also offer lobster rolls, hotdogs and all kinds of other fillings wrapped in a bun. Wash it down with an milkshake, ice cream float or ice cream soda. Stop into this retro fast food mecca and you’ll be happy as a clam—not the one you just ate, obviously. Obviously, this list would be incomplete without Mystic’s claim to fame. Mainly because it’s impossible to avoid. Mystic Seaport: The Museum of America and the Sea takes over much of Mystic as a living museum, recreating a 19th-century coastal village and working shipyard. It houses more than 500 historic ships, including the 1841 whale ship Charles W. Morgan—America’s oldest commercial ship still in existence. Linda Clarke is a freelance travel writer whose work has been published in the Boston Globe, New York Daily News, and several other print and online publications.